Boy oh boy my blogging schedule is all over the place. I just can’t get stuff done the way I used to anymore. Every weekend has been spent differently lately too. We’ve had so many sleepover and kids get-togethers at our house lately. Every weekend has been spent with our kiddos friends. BUT I’m definitely not complaining at all because I enjoy getting to know them all this way. My weekends are spent cooking and cleaning up for them. They do help but it’s not the same. 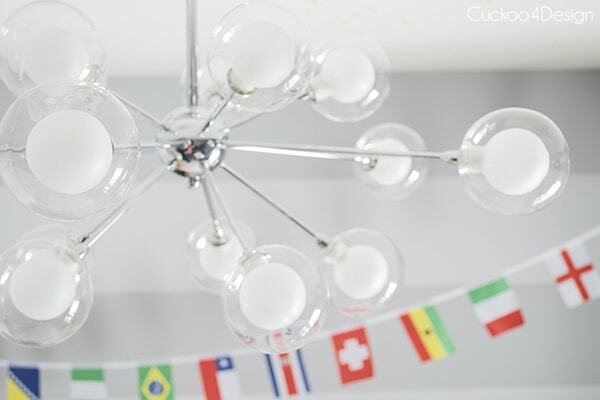 I won a new light fixture (click HERE)!!!! This stuff really does happen on blogs and social media. I haven’t won anything for a long time and I was thrilled to hear that I won the light from Dutton and Brown. I pretty much stalk their Instagram (click HERE) because I’m a huge fan and bought my dining room fixture from them too. So when they ran a giveaway I did everything they asked to participate. And I’m so glad because I won!!! Yippie! There are still a lot of giveaways where not a lot of people participate and the chances are so much higher for winning. Trust me! So I was allowed to pick the color and I gave my son the option to pick. There were so many different colors but for whatever reason he really wanted yellow. Kind of reminds me of lego yellow but whatever… if that’s what he wants… I’ll go with it. I hung it up last week and now that it is hanging I want to add a nice ceiling medallion yet too. I always think that they make every light fixture look so much better. And speaking of splurging, I’d love to add crown molding in his room but that probably won’t happen right now. Maybe one day down the road. Did you see the patches on the wall? That’s where I took down all the shelves which is why I really have to paint his room. I’m still loving the grey stripes but he is ready for a change which I understand. 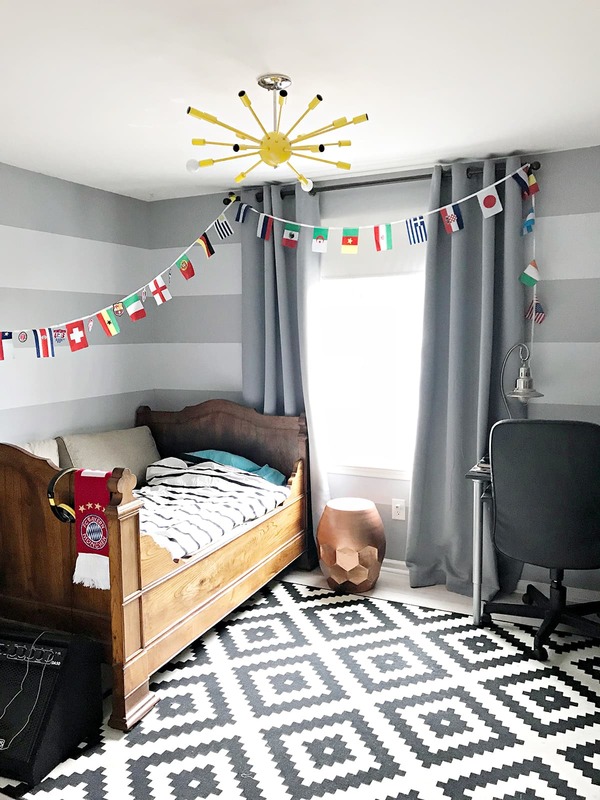 You might also remember that he already had a sputnik in his room before (click HERE for the post). That lovely sputnik went into our basement family room now and I love it down there. It really brightens up the space. When I took down the curtains, I noticed how shot they are and they won’t be going back up either. Time to switch it up. I also want to get him two swing arm lamps to hang over the bed because he is missing a reading light now. Lets talk about the flag banner. We bought it during the soccer world cup in Germany and he loves it so much. It represents everything he is into. Soccer, traveling and world history. 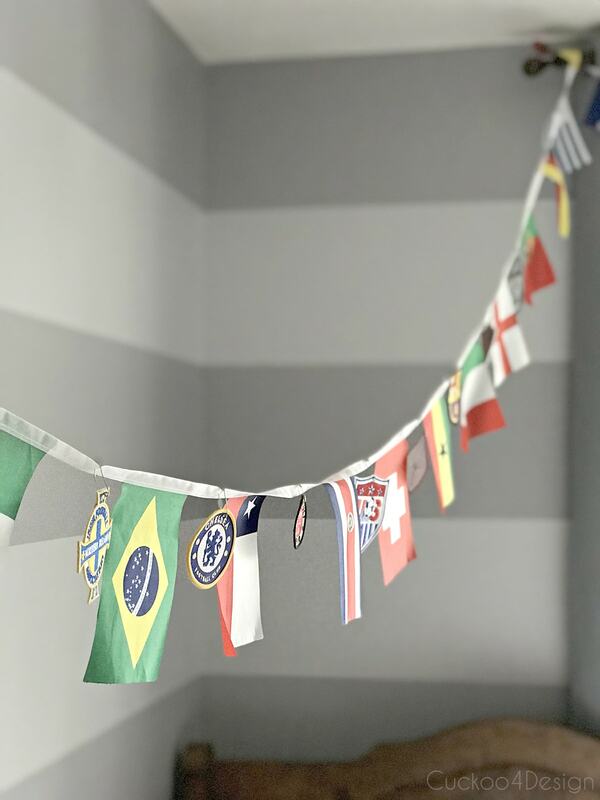 So I actually bought him an even bigger one (click HERE) with 50 flags. He knows all the flags except about maybe 6 of them. He now wants to collect world soccer patches which my daughter actually started. They will get pinned in between the flags. I’m not sure how we will hang them all up. We are probably going to color block the walls in order to keep everything from getting too dark. 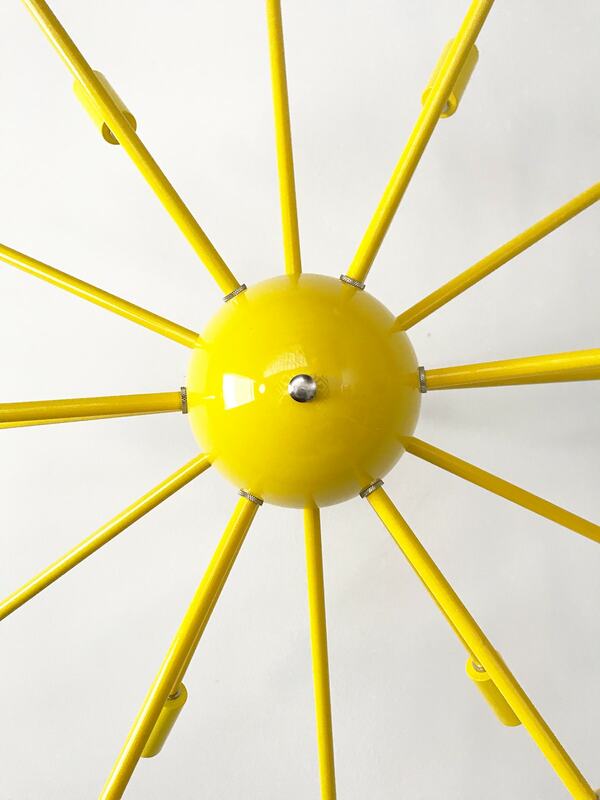 The yellow color in the middle is the color of the sputnik. Him and I are leaning towards the really dark green tones which I think will look nice with the wood tones of his French antique bed. 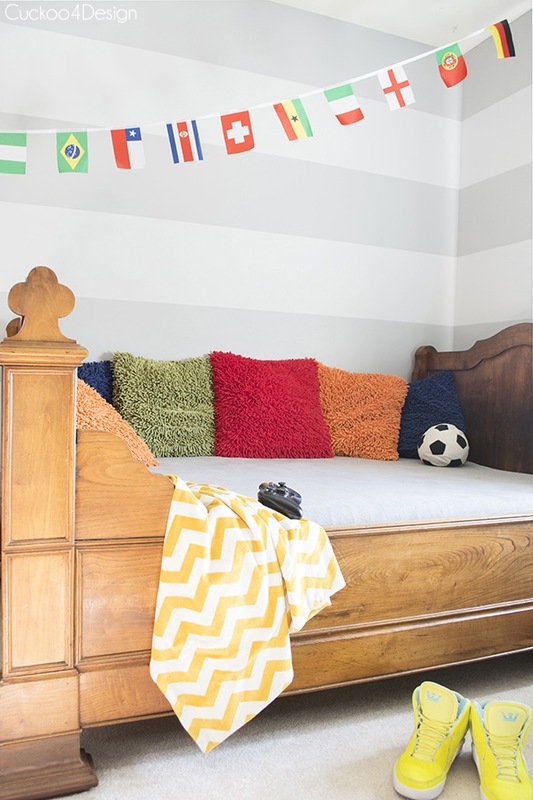 And the soccer wall decals I made him will somehow make an appearance again too. So much more to do and I’m progressing very slowly. So what team are you on? Very dark blue or very dark green? Oh and before I go, remember my post last week about what blogging involves for me and some of the struggles we bloggers face (click HERE if you missed it)? I just read this post about how Facebook is removing publishers like me from the feed unless we pay (click HERE). It leaves all of us frustrated because I don’t think it is fair! You will probably just see large companies who have a budget to promote on Facebook and non of us small bloggers anymore. oooh i love the yellow and love where this is going! 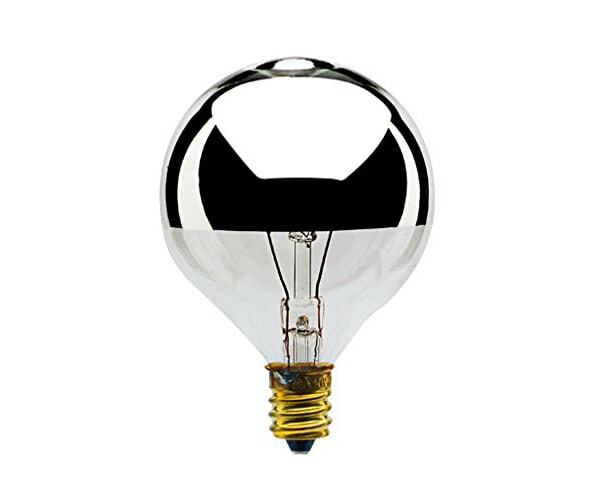 i like the more simple bulbs since the fixture is already a showstopping color. oh and ps i hear you about how much i get done these days vs days of old! I think I’m as excited about the room redo as your son.! I like the white over the two tone bulbs, but let him pick. Yes Sheryll, I think I will let him pick. 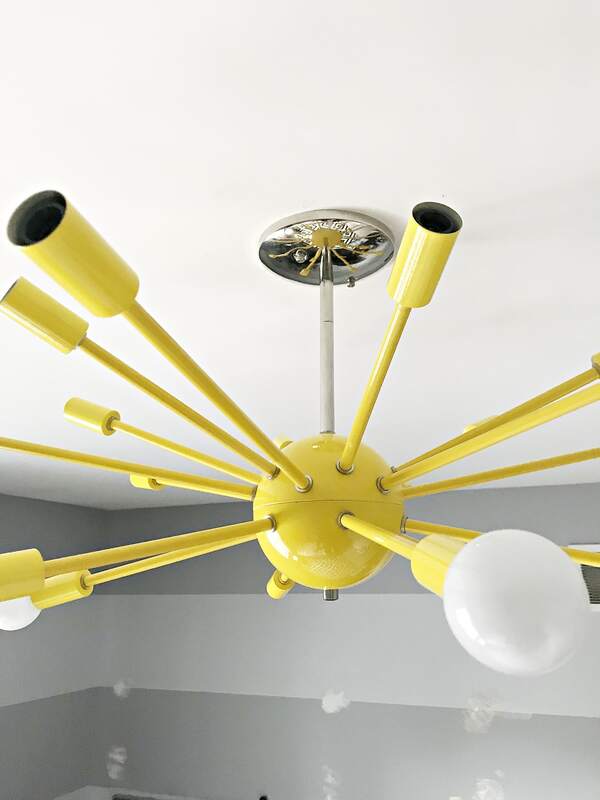 Love the light fixture and free! 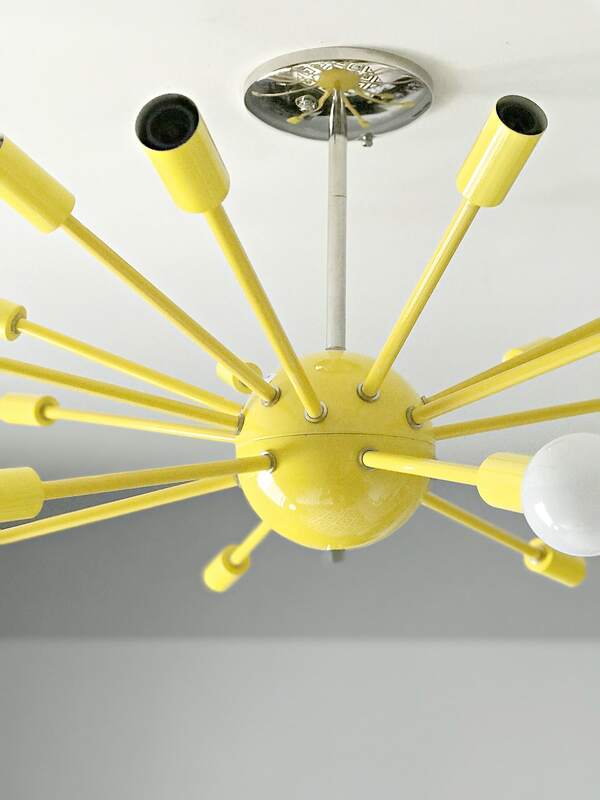 I’m having a total crush on bold yellow these days, love this! The room is coming along great! And I totally understand the frustration of FB and I completely agree, unfair. Personally I’m a big fan of bold yellow and navy blues, but I can see where the dark, hunter like green and yellow will be a great combination too.